Every family has its weekend rituals, and one of ours is a dim sum breakfast in NYC's Chinatown. Then it's a walkabout to stock up on produce and snacks. The last stop is usually the Chinatown Ice Cream Factory. Someone always gets the red bean ice cream, but my go-to is the almond cookie. Here's my take on this flavor. I figured I could just use almond ice cream as a base and mix in crushed cookies. Since finding the cookies you would find at a Chinese buffet wasn't convenient, I headed to the nearest store for Italian almond cookies. My friend MK (who would eat almond paste straight from the tube if no one was looking) was upset at first that I wasn't using "real" almond cookies, but after tasting this ice cream I was admonished not to change a thing about this recipe. 1. Combine almond paste and sugar in medium bowl and beat until completely mixed. 2. Add eggs one at a time, beating well after each addition. Beat in almond extract and salt. 3. Heat half and half to a simmer in heavy medium saucepan. Slowly beat hot half and half into the almond paste mixture. 4. Pour mixture back into the pan and place over very low heat. Stir constantly with a whisk or wooden spoon until the custard thickens slightly and reaches 170-175°F. Be careful not to let the mixture boil. 5. Remove from heat and pour through a strainer into a large, clean bowl. 6. Allow to cool slightly, then stir in the heavy cream. Cover and refrigerate until cold or overnight. 7. Crush cookies into bite-sized pieces and set aside. 8. 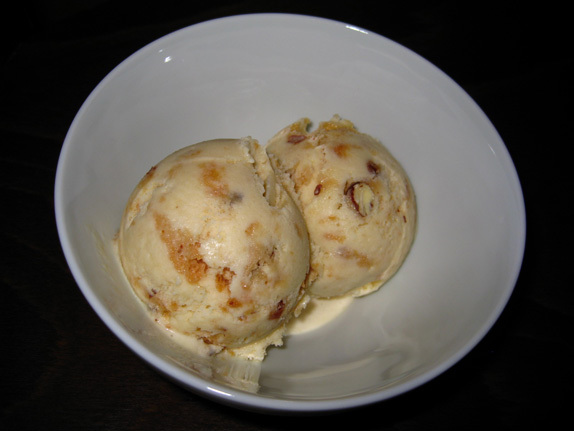 Stir chilled custard, then freeze in your ice cream machine according to the manufacturer's instructions. Add in crushed cookies before you finish processing.